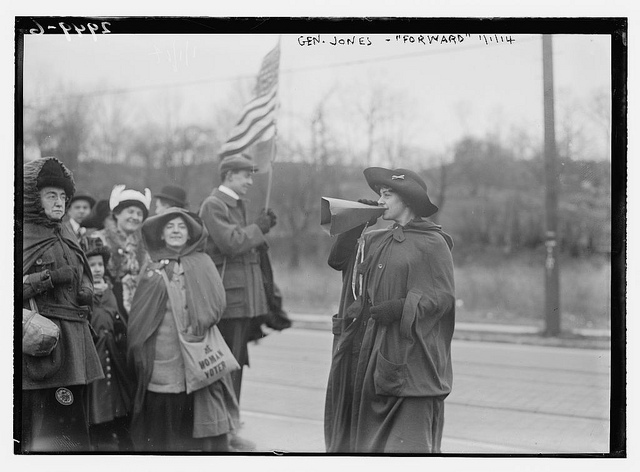 Suffragette Rosalie Jones making noise for womens’ right to vote about 100 years ago. Image provided by the Library of Congress. A century ago women were rallying together, marching towards a shared vision, advocating for each other, and making a lot of noise for the right to vote. These brave noisemakers dared to dream that their daughters and daughter’s daughters would grow up in a world where women and men are equal. Today marks the 100th anniversary of International Women’s Day, a day to celebrate the economic, political, and social achievements of women. I am full of gratitude for the opportunities I have today that women a century ago could only dream of. I run a company, have a University degree, and proudly cast a ballot in the last election. The noisemakers who fought for me to have these opportunities would probably be proud but there are millions of girls and women around the world without these opportunities. I’ve seen the effects of opportunity disparity first-hand from my travels to sixty countries over the last few years. We still need women rallying together, working towards common goals, and advocating for each other. We still need noisemakers. 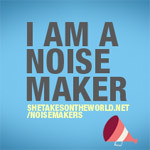 Visit the Noisemakers Campaign page to watch the full video series and find out how you can become a noisemaker for girls and women in developing countries. One of the most powerful things we can do as noisemakers is come together with a shared purpose to amplify the impact we have. As Christine Karumba of Women for Women International said, “One woman can change anything. Many women can change everything.” That’s why I put together this list of noisemakers you can connect with on Twitter. You’ll notice that this isn’t a “Top” list and we’ll be adding to it throughout the day and in the coming days so if you know someone who should be on the list or you’d like to be added, please leave a comment below and let me know. Or you can tweet me @nataliemacneil; I’d love to hear from you. Happy International Women’s Day! Christy Turlington @CTurlington -Model, maternal health advocate, filmmaker, and Founder of Every Mother Counts. Sloane Berrent @sloane -Social innovator and Founder of The Causemopolitan and Answer with Action. Melissa Stewart @melissaonline -Founder of She Owns It, tweeter of inspiration for women. Little Pink Book @littlepinkbook -PINK is a resource for women who have the courage to do what they love without compromise. Natalie Sisson @womanzworld -Founder of WomanzWorld Global Services and promoter of female empowerment. The Girl Effect @girleffect -The Nike Foundation’s campaign to empower 600 million adolescent girls to end poverty for themselves and the world. Lauren Bush @LaurenBushTweet -Hunger activist, social entrepreneur, and CEO of FEED. Tammy Tibbetts @shesthefirst -Founder of She’s the First, a not-for-profit helping girls in developing countries become the first in their families to graduate. Sarah Brown @SarahBrownUK -Global Patron for the White Ribbon Alliance for Safe Motherhood and voice for girls and women worldwide. We Are EQUALS @WeAreEQUALS -EQUALS is a partnership of leading charities that have come together to step-up the call to demand a more equal world. G(irls)20 Summit @Girls20Summit -Brings together one girl from each G20 country and one girl from Africa to speak for 3.3 billion girls and women on how to economically empower girls & women. Selena Rezvani @nextgenwomen -Author of The Next Generation of Women Leaders and expert on women’s leadership worldwide. Oprah Winfrey @oprah -Always taking action to empower girls and women worldwide we honor Oprah’s accomplishments and use of her platform for important causes. White Ribbon Alliance @WRAglobal -An international coalition working to stop needless deaths during pregnancy or childbirth. UN Women @UN_Women -The UN entity for gender equality & women’s empowerment. GirlUp @girlup -A UN Foundation campaign uniting girls to change the world. She Speaks Now @shespeaksnow -Inspiring wisdom from fearless women. Women News Network @womenadvocates -Lys Anzia and the team bring a voice to important issues worldwide. Elizabeth Scharpf @SHEnterprises -CIO of Sustainable Health Enterprises, one of the organizations we are proudly supporting for the Noisemakers Campaign. Robin Cohen @MissRo -Passionate about education and issues focused on women and girls, and Founder of Relevant Beauty. Because I am a Girl @biaagcanada -A global campaign to claim a brighter, safer future for girls. Women for Women @womenforwomenUK -Helping women survivors of war rebuild their lives. The Glass Hammer @theglasshammer -Online community for women to discuss the issues that matter most. Power Women Magazine @powerwomenmag An online publication that tackles issues and acts as a voice for all for women no matter their circumstances or location. Make Mine a Million @M3Award -Make Mine a Million $ Business provides confidence, community and coaching to women entrepreneurs creating million-dollar businesses. Rania Al Abdullah @QueenRania -An international advocate who speaks on behalf of those whose voices are not often heard. She Takes on the World Contributing Team -Follow the whole She Takes on the World team of women empowering women on this Twitter list. We’ll continue to update this list here and on Twitter on the Noisemakers Campaign List. Don’t forget to tell us who to add! Are you a noisemaker? Share our badge! I’d love to see Dearokka Winfrey @PGRDresses added to the list. She the creator of the ultimate feminine movement that everyone has been talking about and becoming a part of. It encourages ladies to embrace their beauty, charm, and intellect and to not neglect themselves. When you look good, you feel good. Their facebook page is http://www.facebook.com/PGRDre… and their website is http://www.prettygirlsrockdresses.com. You should add @CatalystInc – we work globally to expand opportunities for women in business, and work to increase diversity in the workplace. Equality might be a long way off, but we’re prepared for the struggle! Love, love, love this article! Thanks for posting.